I’ve been so busy gardening, I didn’t get a chance to post! In the two weeks since my visit to Plainview Farm, I have been working on the next section of my new front garden, the Lavender Walk. The Lavender Walk consists of two flower beds that run along either side of a narrow walkway at the front of my house. 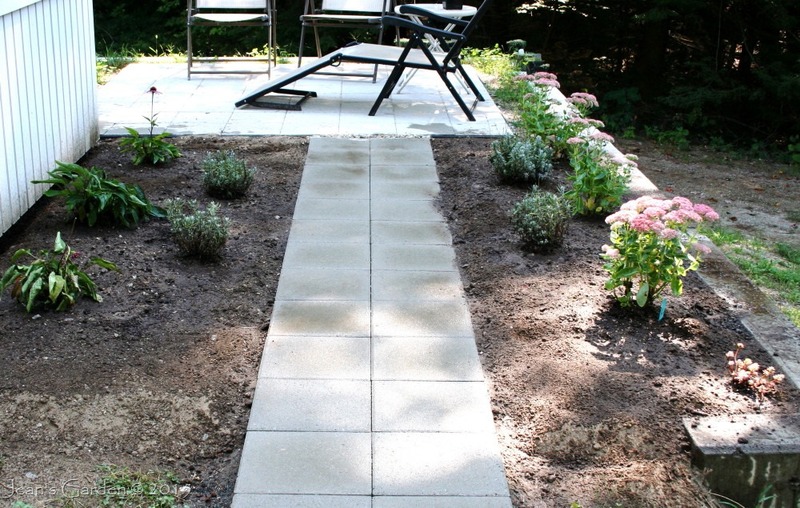 The walkway is 28’ long, linking the patio to a future path down to the lower garden, but the Lavender Walk extends only the first 11’, filling the space between the front of the deck and the retaining wall. The Lavender Walk was inspired by my mother’s love of lavender and her desire to have it growing in her garden. I never succeeded in getting it established there, but I think the conditions of my sandy soil and this full-sun location will be more to its liking. I am planting it here as a tribute to my mother (and also for the sensual pleasure of its fragrance!). 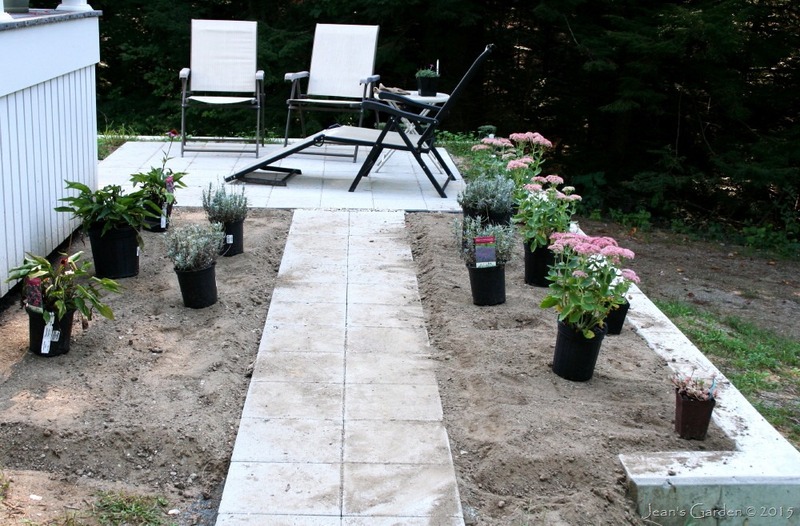 Planting lavender in this location also helps make the transition from the entry garden to the fragrant garden, which will be bordered by this same walkway, in the area beyond the deck. 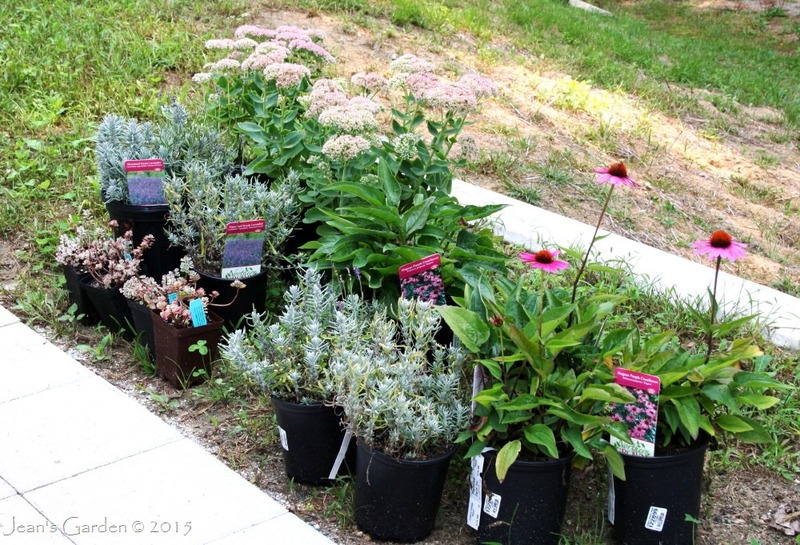 I bought most of the plants for the Lavender Walk two weeks ago during my visit to Plainview Farm nursery. As you can see, this is not just a planting of lavender – although two different varieties of lavender (‘Hidcote’ and ‘Munstead’, the only two that are reliably winter hardy here) anchor the planting. On the side of the walkway by the deck, Lavandula augustifolia ‘Hidcote’ is planted with Echinacea purpurea ‘Magnus’, a combination that I used to admire in the garden of one of my mother’s neighbors. On the retaining wall side, Lavandula augustifolia ‘Munstead Strain’ is combined with two types of sedum, Sedum x ‘Autumn Fire’ and the groundcover Sedum spurium ‘Tricolor’. I am hoping that the latter will spread over the top of the retaining wall and spill down its exposed side. 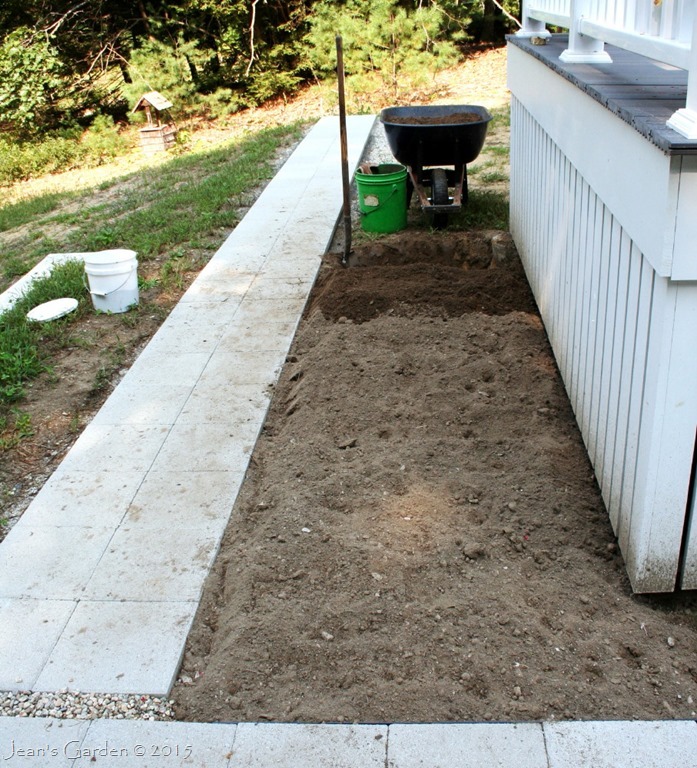 Before I could plant, I needed to prepare the soil, removing the weeds that had seeded themselves since my construction was completed last fall and adding soil amendments. I amended the soil less than I normally would because these plants like a lean, dry sandy soil. I did, however, add some wood ash to sweeten the soil at the front of each bed for the alkaline-loving lavender. Once I had finished preparing the soil, I let it settle for a couple of days, then tamped it down with the back of my garden spade and spotted the plants. As you can see, I didn’t have all the plants I need to fill these flower beds. This was not the best time of year to buy lavender, and I could only find two healthy specimens of each variety at the nursery. I’ll add two more of each next spring when they are more readily available. 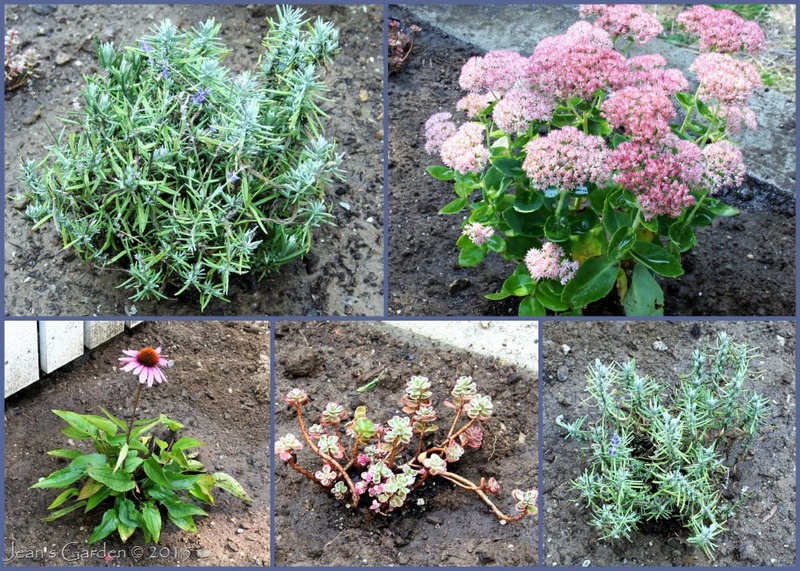 I’m also thinking of adding another low-growing sedum, possibly Sedum spurium ‘John Creech’, to fill in between the lavender plants along the walkway. 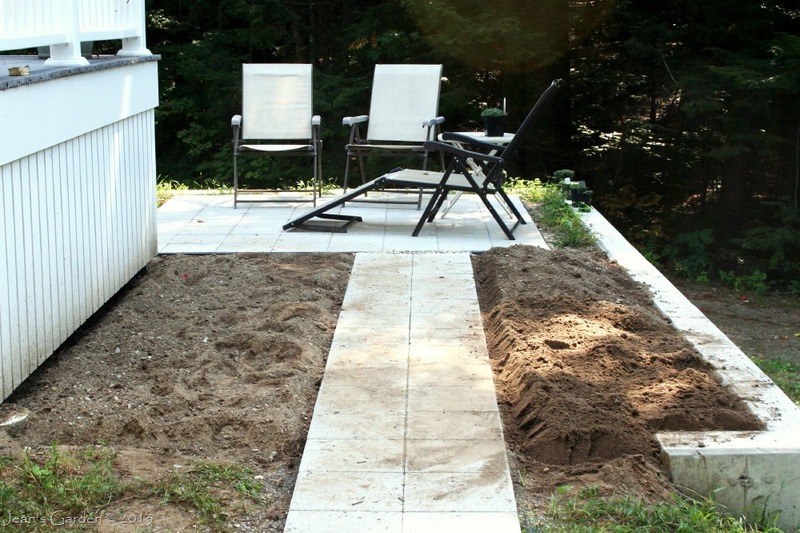 For now, though, I am considering this planting done and moving on to the last section of the entry garden to be created this year, the Patio Border. You have chosen a beautiful combination of plants! I have always loved lavender, but it is short-lived here. Nothing beats the fragrance. The sedum is also lovely. Sedums are becoming a favorite of mine; they give so much for so little effort. Deb, Lavender could be short-lived here, too. L. augustifolia is listed by Armitage as cold-hardy to zone 6, but the Missouri Botanical Garden lists both these varieties as hardy to zone 5, which I’m on the northern edge of. 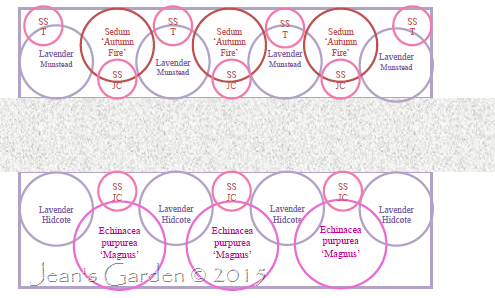 I grow plenty of other zone 5 plants, and I know other gardeners locally who grow these two varieties of lavender. With all the zone 5 plants, I run the risk that if we had very cold overnight temperatures when there was no snow cover, I could lose them. It is such fun to see the progress of your garden…I love the reason you added lavender; I have it along my front walk to welcome visitors. Charlie, It’s fun for me to see the progress, too. 🙂 I’m hoping to use the lavender as a lure to draw people from the patio down to walkway to the lower garden. What a beautiful idea to have a lavender walk and inspired by your mother! I love so much lavender I would have a field of lavender like in the ones in France. Your design looks just fine and now is time for nature to do its part! Great! Lula, I’m excited by this planting, which includes several plants (including lavender) which I haven’t grown in my garden before. I will wait with bated breath to see how they’re doing when they emerge in the spring. Nothing says progress so much as the placement of plants. It’s going to be beautiful! Kris, I agree; getting plants in the ground provides a sense of progress. I don’t think I’d have the staying power to get through a huge project like this front garden without the satisfaction of stopping every 2 or 3 weeks to get some plants in place. so exciting to get the plants in at last. I’m still at the spotting about stage! Diana, Because I’ve divided this big project into many small segments, I get to plant each small segment once the soil is prepared. It is exciting to get some plants in the ground — and it provides motivation to keep me going through all the digging! I’ve just taken off my garden gloves and boots to read your post, and you look so very organised, I’m filled with new resolve to organise my planting a little bit more! Many thanks..
Gerrie, I’m happy to have given you an excuse to take a break. 🙂 Organization is my middle name. I admire the more artistic gardeners who can do free-form planting and come out with something beautiful. I don’t have those skills, so I substitute lots of advance planning and being very methodical. I love watching the progress of your work. As the plants fill in and spread, I’m sure your lavender walk will be spectacular and fragrant. I know you often create a calendar at the holidays, but someday soon, you will be making sachets of lavender! Kevin, Wouldn’t it be wonderful to have so much lavender that I could make gift sachets for the holidays! I would love that. It will be exciting to see how quickly these plants fill in and spread. Very nice. I like the way you have created patterns with the plants. Thanks, Jason. We’ll see how the patterns on paper look in three dimensions in a year or two! Hi Jean, your gardening is so well organised, planned and documented with that border plan and the geometric layouts and formal-style planting, it’s such a refreshing contrast to my dis-organised “oh, it’ll fit there”, chaos! I can’t wait to see the planting fill out and establish, I hope your lavender thrives. Jean I am envisioning this garden…what a wonderful look, feel and scent! Donna, I have my fingers crossed that it will work out as planned. I’m going to have to make a note of those Lavender plants. So far, Lavender has not done well in my gardens – and I love the plant. Shyrlene, Of course, the fact that I have planted lavender doesn’t mean it will grow well here. 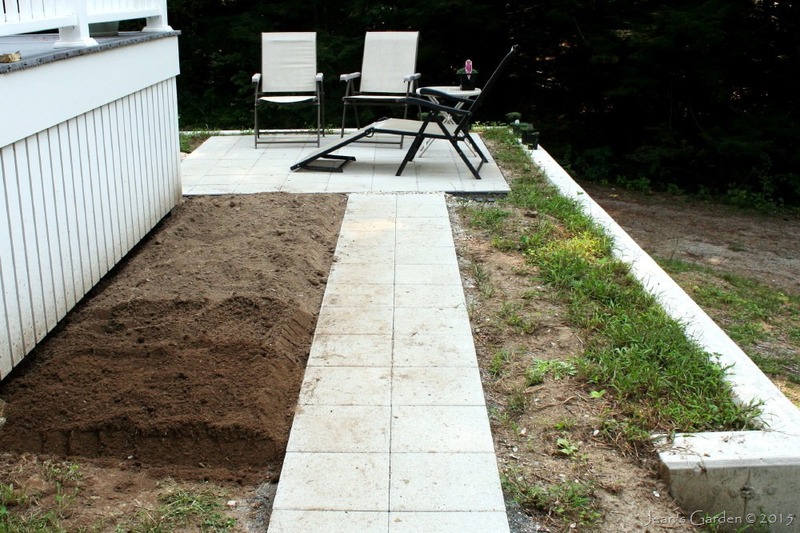 I do have the ultimate well-drained soil (I garden on a big glacial sand deposit), which should help.